Could you give up the internet for Lent – or even for good? Following various reports about companies stealing information and complaints about oversharing on social media, a web hosting firm has created a nine-step guide on how to disappear from the web completely. It includes deactivating accounts, removing links from search results and how to remove yourself from various lists – and for people who’d rather just stay hidden than disappear, the guide also gives tips on how to use the internet anonymously. 1. Close your Facebook, Twitter, Google+ and LinkedIn accounts. 2. 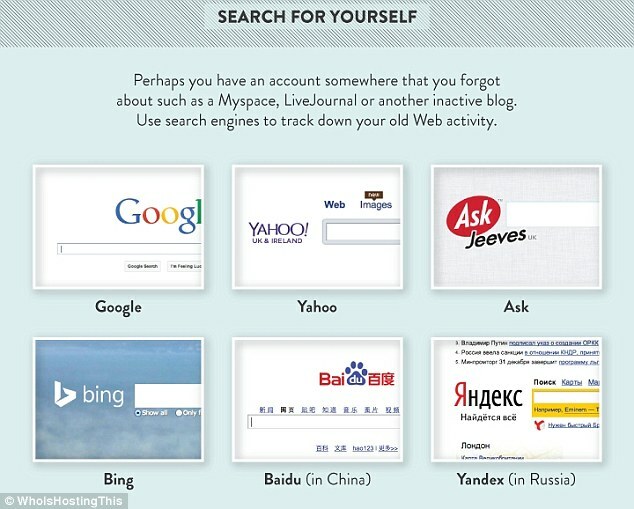 Search for yourself online and close any accounts you’d forgotten about. 3. 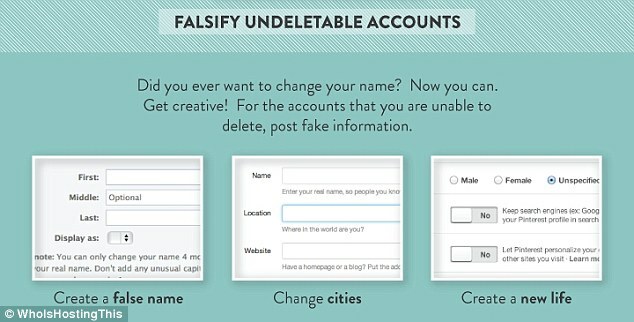 Falsify information on accounts that can’t be closed or deleted. 4. Unsubscribe from mailing lists. 5. Delete search engine results. 6. Contact websites directly and ask them to remove details about yourself. 7. Ask data clearing houses – companies that collect and sell data to other firms – to remove your records. 8. Ask to be unlisted in phone books and online directories. 9. Delete your email accounts. ‘Social media has made everyone’s life an open book – one that’s open a bit too far in some cases. ‘For [people] concerned about their personal information potentially costing them jobs and relationships, the decision to ‘pull the plug’ is an increasingly attractive one,’ said London-basedWhoIsHostingThis (WIHT). There are a number of sites that can help users delete their information, such as DeleteMe and JustDelete.me. 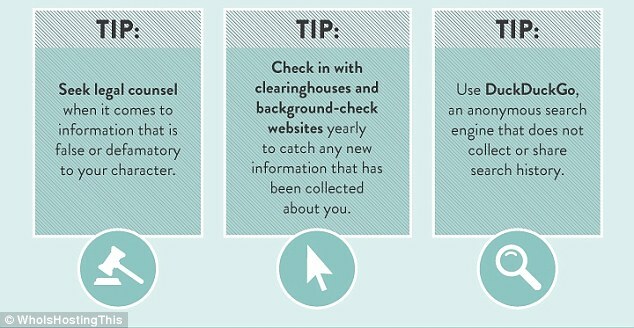 However, for people who want to do the job manually, WhoIsHostingThis’ infographic details the nine steps needed to disappear from online completely. 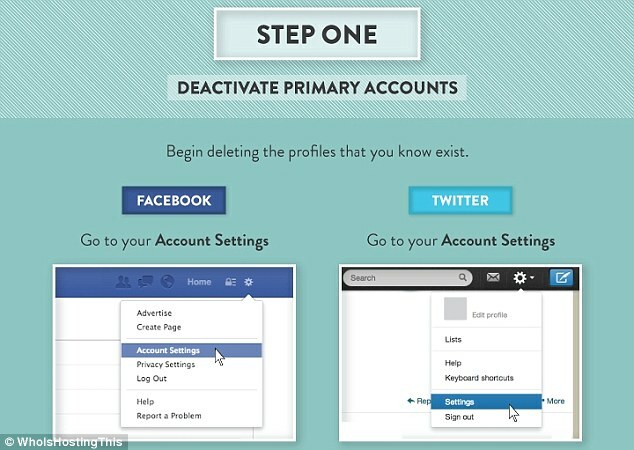 The first step involves deactivating primary accounts, such as Facebook, Twitter, Google+ and LinkedIn. WIHT’s infographic gives step-by-step instructions for each account. In the second stage, WIHT recommends users search for themselves online. This reveals which sites a user has signed up for in the past, but no longer uses, such as a MySpace. The third step in WIHT’s nine-step plan involves uploading false information into the accounts that can’t be deleted, including fake names and locations. Step four involves unsubscribing from mailing lists using emails in an inbox and junk folder as a starting point. If, while searching from their name on Google, users find various links that include information about them, they can ask the search engine to remove them. Google has a URL removal tool, for example. However, Google is not obliged to remove links – especially if the website is owned or hosted by another company. In this instance, WIHT recommends contacting the website directly and asking them to remove any references. There are also services, known as data clearing houses, that collect information from sites to sell to advertisers, for example. WIHT admits this is one of the most difficult places to remove data from but suggests being persistent with phone calls and letters. The final two steps involve contacting phone companies and online directories, and asking to be made unlisted before deleting every email address. ‘In order to maintain your new-found anonymity, you must master reputation management, learn to use dummy accounts, and take advantage of anonymous searching – on sites such as Duck Duck Go,’ explained WIHT.